RSL 100 is a weight filling machine for olive oil and for many other liquids. 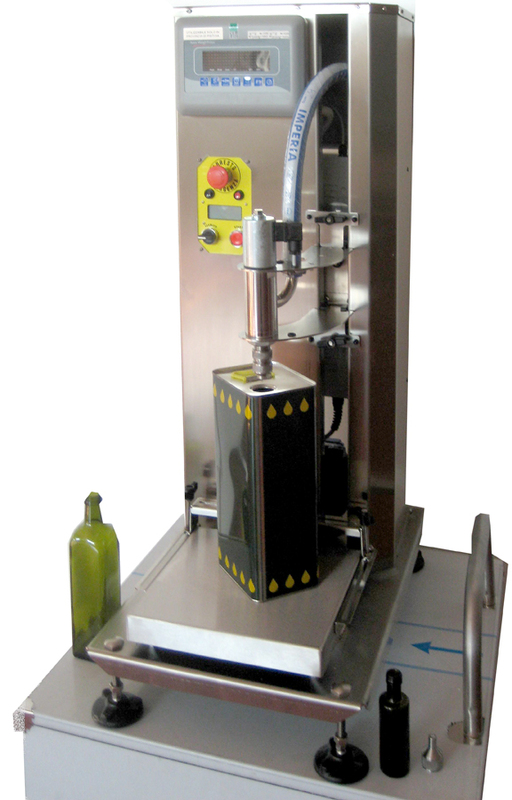 It can fill many different containers (tinplate cans, PET bottles, glass bottles, vials etc.). Stainless steel AISI 304 trolley. Automatic lifting system (up-down) of the nozzle. Data management for tracking by the means of a line-printer or remote printer, suitable for printing labels. Stainless steel AISI 304 structure. Pump with a variable flowrate. Quick selection of the volume of the container. Buzzer at the end of filling. Minimun division: gr.1 (from1Kg to 5Kg) gr. 2 (from 5kg to 10kg). Dimensions of the weighing platform 300mmx300mm (other dimension on request). Filter to reduce a minimun the chance of dripping.